You can't get any hostel better than this. I felt like staying here for ever. Lovely location, nice atmosphere and everything was perfect. Gary, who manages the hostel, does an amazing job. Amazing location right at the doorstep of the Wicklow mountains. The hostel itself is relatively newly built, modern, clean facilities. Just what one would hope to expect from YHA. Had the chance to have a big room all for myself with a beautiful view on the mountains. The location is very remote but for me that was the best part. I loved my stay here, met some lovely people and the staff were very friendly. The hostel was clean and the self catering facilities were great. Loved the location too, it feels like its in the middle of no where but its not, the scenery is stunning, very close to Powerscourt House and Gardens and of course the Wicklow way. Thank you for a lovey stay! I had an amazing time. Location is perfect, staff are helpful and friendly. It was a quiet time of year so I didn't experience the full atmosphere I think that it reaches when full. Def would stay again. Clean, nice rooms with amazing views and good hikes in the area. Meant to stay for 2 nights, added an extra night because it was so nice. 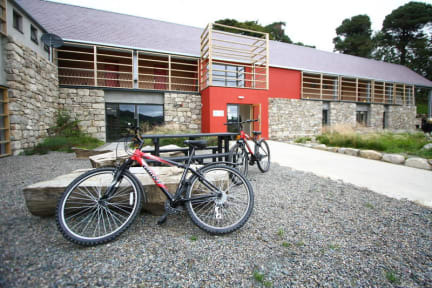 Perfectly positioned along the Wicklow Way, great set-up and facilities. Warm and friendly. I will definitely stay again. The staff was 50/50 the front desk girl was really nice when I checked in, the people who volunteer to work their for free bed were cool but that Gary dude is a complete douchebag. You should avoid at all cost. The people I had to bunk with were all cool, and the room was nice. Beware though in the middle of nowhere if you want to walk to the Enniskerry it may take up to an hour and bus comes every so often.